Free shipping. Buy direct from HP. See customer reviews and comparisons for the HP 17.3 Signature Slim Topload Case. Upgrades and savings on select products. Sleek contours enclose two main padded pockets, with extra pockets throughout. The HP 17.3" (43.9 cm) Signature Slim Topload is metro chic with modern simplicity. 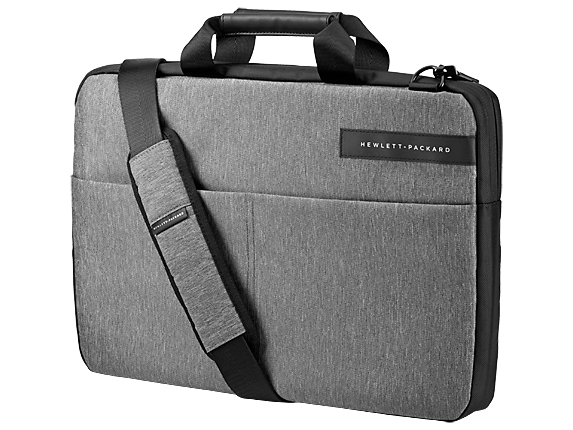 Metro chic allure: Noticeably refined, the case's contoured design is distinguished by a heather grey exterior and strategic black detailing. The pockets unveil a deep blue interior throughout. Two full-sized padded pockets provide storage for notebooks up to 17.3 inches (43.9 cm) and separately for tablets. In addition to the padded walls and divider, the base is reinforced with padding. Additional storage for pens, phone and other accessories is available throughout in various compartments.